Ten college students locked in an intense moral argument over how to treat a sexual encounter that happened in their midst. 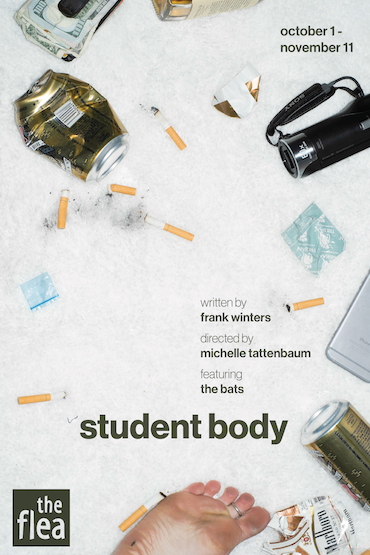 Student Body was originally commissioned, developed and performed at the Lee Strasberg Theatre and Film Institute in New York City as part of the Clifford Odets Ensemble Play Commission in December 2014 under the title The School Play. The production features The Bats: Tommy Bernardi (The Nomad), Sydney Blaxill (The Nomad), Alexandra Curran, Alex J. Gould (The Mysteries, a cautionary tale), Adam Alexander Hamilton, Comfort Katchy, Alesandra Nahodil (The Old Masters, The Mysteries), Daniela Rivera, Mariette Strauss (Sarah Flood in Salem Mass), and Audrey Wang. Understudies Jessica Cannizzaro (The Mysteries), Jack Gilbert (The Mysteries, The Feast [u/s]), and Olivia Jampol (The Cutthroat Series: Grand Guignol Duels).The creative team includes Jerad Schomer for Charcoalblue (scenic design), Elizabeth M. Stewart (lighting design), Stephanie Levin (costume design), Lee Kinney (sound design), John L. Puma (fight choreography), Kaila Hill (production stage manager), and Eh-den Perlove (rehearsal stage manager). FRANK WINTERS (Playwright) is a writer, director, and actor. His written works include Home Movies, On the Head of a Pin, and The School Play. He was the 2014 recipient of the Clifford Odets Ensemble New Play Commission through the Lee Strasberg Theatre and Film Institute. He is a graduate of the SUNY Purchase Acting Conservatory and a Co-Artistic Director of Strangemen & Company.